Norfolk is a fabulous county to visit with a wide variety of tourist attractions, whether you're into relaxation, bird watching or nature reserves, boating, stately home, the sea side or whatever. Even Norfolk is quite flat, you can even go Skiing at the dry slope in Norwich. The North Norfolk coastline is a designated area of outstanding natural beauty and ranges from fabulous, uncrowded sandy beaches (many with Blue Flag awards) to pebble shores with rock pools and cliffs. A huge variety of coastal towns and villages are scattered around with each one offering something different for you to explore. If you're a nature lover, few places in the country offer such a diverse habitat as Norfolk. The whole county of Norfolk is littered with Nature Reserves and Sites of Special Scientific Interest. Eastward around the coast is Great Yarmouth, England's second largest seaside resort. Here the family can enjoy a traditional British seaside holiday with amusements, piers, fair-ground rides, a acclaimed circus and, of course, ice cream. The Norfolk Broads is one of England's most recent areas to gain National Park-style status and offers a tranquil setting for a lazy day on the river; just hire a day boat and enjoy. Here's just a few ideas to whet your appetite for a holiday or short break in Norfolk. 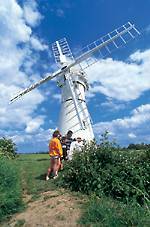 There are many opportunities to see the stunning Norfolk Broads. Most broadland villages have a staithe (a local word for a mooring point) and many local boat yard operators offer Day Boat hire. Consider our sister company, Freedom Cruisers for a great deal on Norfolk Day Boats and Cruisers for hire from our central location in Horning. If you venture to Irstead, you can take a trip around Barton Broad on a ecologically sound Solar Powered boat, Ra. Operated by the Broads Authority, this vessel is an ideal way to see one of the best of the Broads. Why not extend your Norfolk Holiday on a quality river cruiser from Freedom Boating Holidays. Our sister company offers a range of affordable Norfolk Broads Holidays onboard a range of self-drive boats. See Norfolk Holiday Cottages in this area. Great Yarmouth is England's second largest Seaside resort and has much to offer a family holiday. There's the usual Seaside fun with amusement arcades and funfair rides, a pier, renowned circus and much more. For a more sedate look at Yarmouth, why not take a horse and carriage ride along the promenade? Norwich is a fine city with hidden gems around every corner. Cromer seaside popularised in the Victorian age with the advent of the railway. Cromer is a pleasant town with a fabulous beach and pier and plenty else to see beside. It's church has the highest tower in Norfolk and is occasionally open for viewings. During August, Cromer hosts a week long carnival with an evening procession. Norfolk has a number of stately homes open to the public. Some are under National Trust ownership, others private; all are worth a visit. Consider the National Trust properties of Blicking Hall, Felbrigg Hall & Oxburgh Hall, along with Somerleyton Hall, Mannington & Woolerton, Holkham Hall and the Queen's residence at Sandringham. Norfolk has a massive collection of churches - probably more than any other county. Norfolk was a popular landing place for invaders, so much so that for a brief time, Norwich was the capital of the country. The invaders brought religion with them and churches were constructed in even the smallest of settlements. Today, many survive. Most have stone and flint external facades, some are quaint with thatched roofs. Some, like St Helens at Ranworth have bell towers that are open to the public. Others are curious constructions like St Mary's at Burgh St Peter (pictured). All are worth visiting whether you're religious or not. Horsey is a National Trust Nature reserve on the northern reach of the Norfolk Broads. Within sight of the sea wall is this fabulous restored wind pump. Four stories high, it is open to visitors and you can climb all the way to the platform at the cap which offers stunning views over Horsey mere. Horsey itself is a small hamlet village with a beautiful thatched church. On Horsey Gap Beach, you are likely to see a colony of seals. Norfolk has a hugely varied coastline. From Yarmouth in the east around to Sheringham in the centre of the coast, the beach is mostly sandy, sometimes with little more than sand dunes and marram grass banks separating it from the fragile landscape. From Happisburgh around to Cromer, the coastline undulates being mostly cliffs. Sheringham has a cobble beach which soon changes back to sand as you head west. Holkham beach is a wonderful area. Set in a natural bay this vast expansive beach is more like Meditarean than East Anglia.